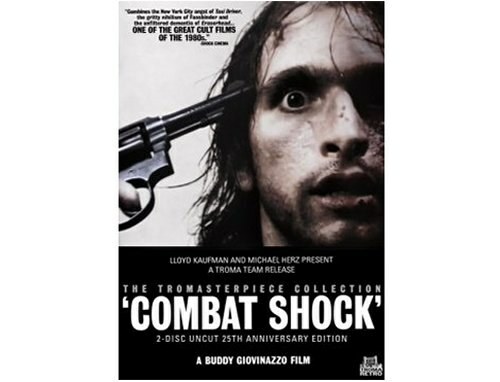 Nearly 25 years after its initial release, Buddy Giovinazzo’s Combat Shock returns from the cult underground to reclaim its title as perhaps the most shocking independent film of the ‘80s. Staten Island born punk rock drummer Buddy Giovinazzo made his indelible D.I.Y. debut as writer/director/producer/editor with this nihilistic, pitch-black saga of poverty, hopelessness and violence that remains as harrowing today as it was at the height of Reagan’s America. While originally marketed as a grindhouse shocker, Combat Shock was instead embraced by alternative audiences around the world as a searing portrait of urban despair and post-Vietnam horror. Troma’s two-disc set includes the original theatrical cut, as well as Giovinazzo’s never-before-seen Director’s Cut under the film’s original tile of American Nightmares. The DVD also features several of Giovinazzo’s ‘80s short films and music videos, and the all-new documentary Post-Traumatic that explores the continued impact and influence of Giovinazzo’s work on current transgressive filmmakers. Combat Shock launched the career of one of the most unique and enigmatic artists on the international scene. As an author, Buddy’s four celebrated novels had critics hailing him as “the Hubert Selby of the ‘90s”. As writer/director, his 1996 feature No Way Home starred Tim Roth, James Russo and Deborah Kara Unger, and was acclaimed by European audiences for it Cassevettes-influenced realism. When the Berlin film scene embraced Giovinazzo’s provocative output in the ‘90s, he moved to the German capital where he currently directs television crime dramas while writing German-language novels. Giovinazzo recently returned to Los Angeles to direct his first English language film in ten years, Life is Hot in Cracktown, based on his celebrated 1993 novel of the same name. The ensemble drama, which stars Ileana Douglas, RZA, Shannyn Sossamon, Lara Flynn Boyle, Kerry Washington and Vondie Curtis Hall will be released theatrically this summer.